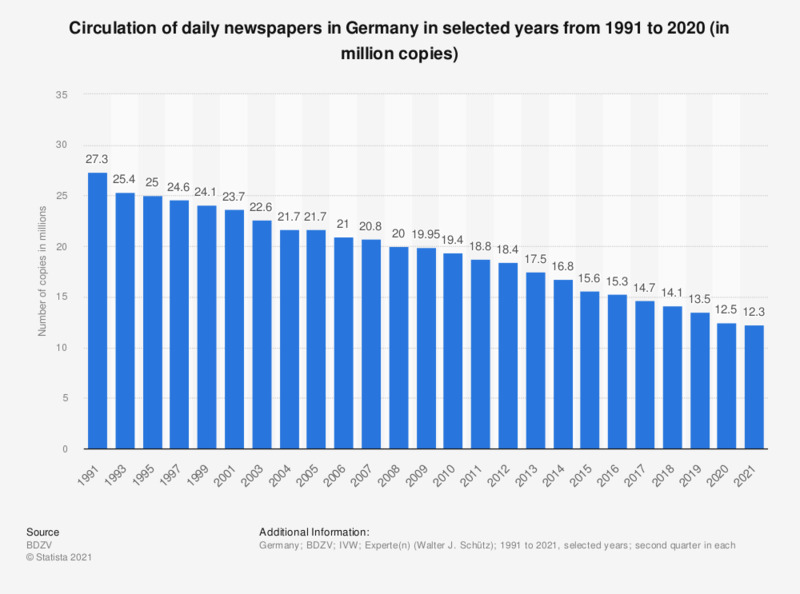 This statistic shows the circulation of daily newspapers in Germany in selected years from 1991 to 2018. In 1991, German daily newspapers had a daily circulation of roughly 27.3 million copies. Twenty years later, circulation figures amounted to less than 19 million copies. German daily newspaper circulation has been declining steadily during the evaluation period. As of 2018, the number of copies sold amounted to 14.1 million - a steep drop compared to the figures from 1991. Several key factors contribute to these developments include the expansion and rapid advancement of online news media, with consumers switching to finding the information they search for online instead of in print, as well as rising mobility and the desire to use media and read news on the go. Last but not least, the continuing rapid development and use of mobile devices such as tablets or mobile phones also changes news media preferences among consumers, particularly in regard to print media, and among these, daily newspapers.